LONDON (Sheraz Khan ) Former interior minister and leader of (PML-N) Chaudhry Nisar on Thursday attended the funeral prayers of Kulsoom Nawaz, wife of former prime minister Nawaz Sharif in London. 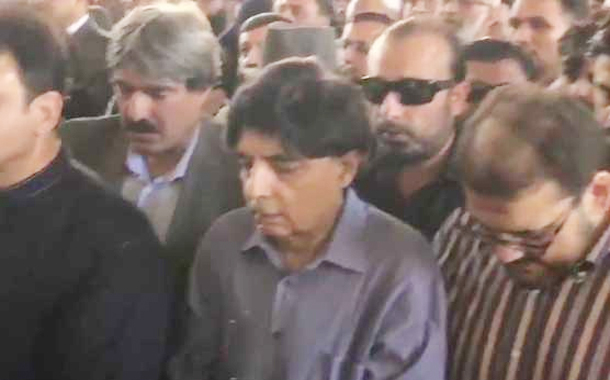 Chaudhry Nisar, who had been away from the limelight after recently held general elections, was seen today (Thursday) attending the last rituals of former first lady at the London’s Regent Park mosque. Family members, prominent political figures including Hussain Nawaz, Hassan Nawaz, former Punjab CM Shehbaz Sharif, former finance minister Ishaq Dar also attended the funeral prayers. It is pertinent here to mention that neither the former minister was seen on media nor he took oath as member provincial assembly after his defeat in the general elections. Nisar left the London’s Regent Park mosque without talking to media after attending the funeral prayers. On Tuesday, Begum Kulsoom Nawaz, the wife of former prime minister and Pakistan Muslim League-Nawaz (PML-N) supremo Nawaz Sharif ahd passed away at London’s Harley Street Clinic after a prolonged battle with cancer. She was born in 1950 in Lahore to a Kashmiri family. She attended Islamia College and graduated from Forman Christian College in Lahore. She also received a Master’s degree in Urdu from the University of the Punjab in 1970.